The next stop on the PUBG esports calendar is just around the corner. The PEL Kick-Off Cup will take place from April 30 - May 5 and will be the first clash between the European region’s two main divisions: PEL and PEL Contenders. 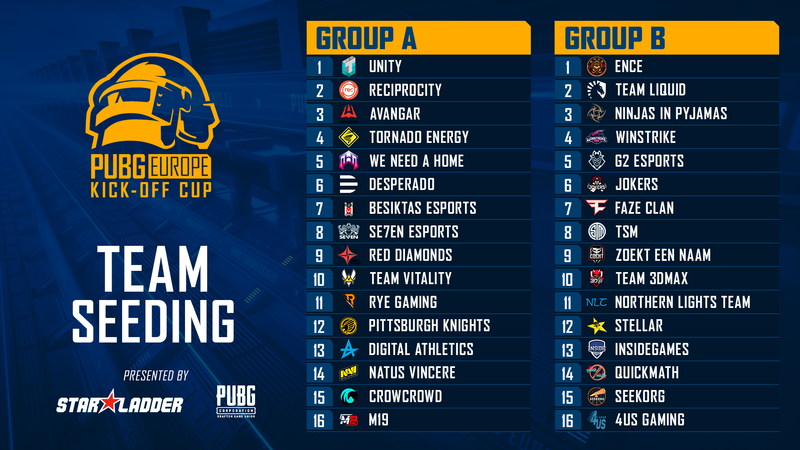 A total of 32 PUBG Europe teams will participate in the PEL Kick-Off Cup with $125,000 on the line. All 16 PEL teams from Phase 1 Kick-Off will fill half of the tournament slots. The other berths will be awarded to the top 16 teams from PEL Contenders Phase 1. The Kick-Off Cup should offer a glimpse into how the two divisions match-up and a preview to PEL Phase 2, when promotion and relegation between the PEL and PEL Contenders divisions will come into play. • Both Groups will have 8x PEL Contender teams and 8x PEL teams. • From each group, the top 8 teams will advance to the final stage of the tournament, where we will find out who reigns over Europe. There will be 24 total matches in the group stage, played from April 30 to May 2. Eight matches will be played every day of the group stage, with each group playing four total. Group A matches start at 12:00 CEST and Group B matches start at 17:30 CEST. Once the top 16 from the group stage are decided, the final stage’s 12 matches will start May 3 and conclude May 5 with the crowning of the Kick-Off Cup champion. Points will be awarded based on the revised SUPER guidelines and competitive format currently in use for PEL and PEL Contenders. The format rewards aggressive, kill-focused play, making for intense matches and plenty of highlights. Mark your calendars for April 30 and clear your schedule. The Kick-Off Cup will bring top level competition your way as the PUBG Esports world prepares for Phase 2. More information about the tournament will be available at a later date. Please check the PEL website and our social media channels for updates!